Lenovo loves a hinge. It's almost as if its latest line-up hinges on how many hinges it can put on a laptop - a case in point is the Lenovo ThinkPad Yoga 2 Pro. But the Yoga is only for those with access to a whole heap of money. For the rest of us there is a budget variant called the Lenovo Flex. 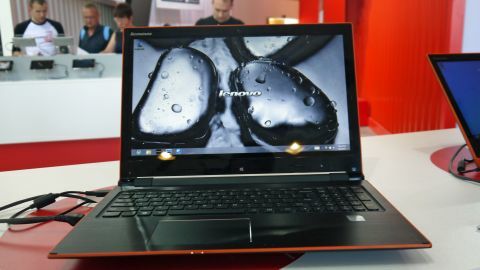 At IFA 2013 we managed to get our hands on the Lenovo Flex 15 (there is also a 14-inch edition for those who want to lose an inch), a laptop that offers up to 300 degrees of rotation thanks too, you've guessed it, some hinges. The hinges on the Lenovo Flex line-up aren't as sleek as the Yoga's, though. Here they are chunky and cheerful. They aren't as noticeable when the laptop is in normal mode, but flip it to its stand stance and you can help notice the bulk. Not that we mind, though, the whole design of the laptop is rugged and industrial and this definitely goes well with the look. Underneath the chassis there's a number of decent specs that raise the Flex 15 above its budget price tag. For a start you get genuine Windows 8, up to Core i7 in the processor stakes and up to a 1TB hard drive if you opt for the 15-inch variation. Graphics wise there's a NVIDIA GeForce GT740M graphics card on board, as well as up to 8GB of memory. And when it comes to ports, you have one USB 3.0, two USB 2.0 and also a 720p front-facing camera. When you first try and adjust the Lenovo Flex 15 you do find that it isn't actually that flexible. Yes, you can put it into a stand-style mode but the bumper hinge means you can't go any further. So, this isn't a device for those who want a tablet hybrid. We are not really sure how many people will use it in stand mode either. That is unless you want to use the Flex 15 as a movie-watching device. You may also want to use it for PowerPoint as well, but this form factor does seem a little limited. Flipping it does completely hide the keyboard as well, so does force you to use the touchscreen. This is no bad thing, however, as the1080p screen with its 10-point mulit-touch technology was nice and responsive. Not as good looking as the Yoga 2 Pro but a lot cheaper, the Lenovo Flex 14 and Lenovo Flex 15 have a release date of October, with pricing from $629.